Wax Poetics, my favorite music magazine, is doing a giveaway of the 20 year anniversary (damn!) rerelease of Illmatic. The CD rerelease is pretty fancy and this is just the album on vinyl with no frills. But hey, if you want that album and don't have it, why not throw your hat into the ring? 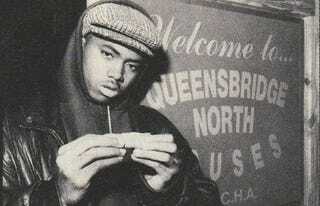 I love Nas and it kinda bums me out that he lives in L.A. now? I mean, do you bruh but still.